Inder Loves Folk Art: Maggie's Birthday Hanami. 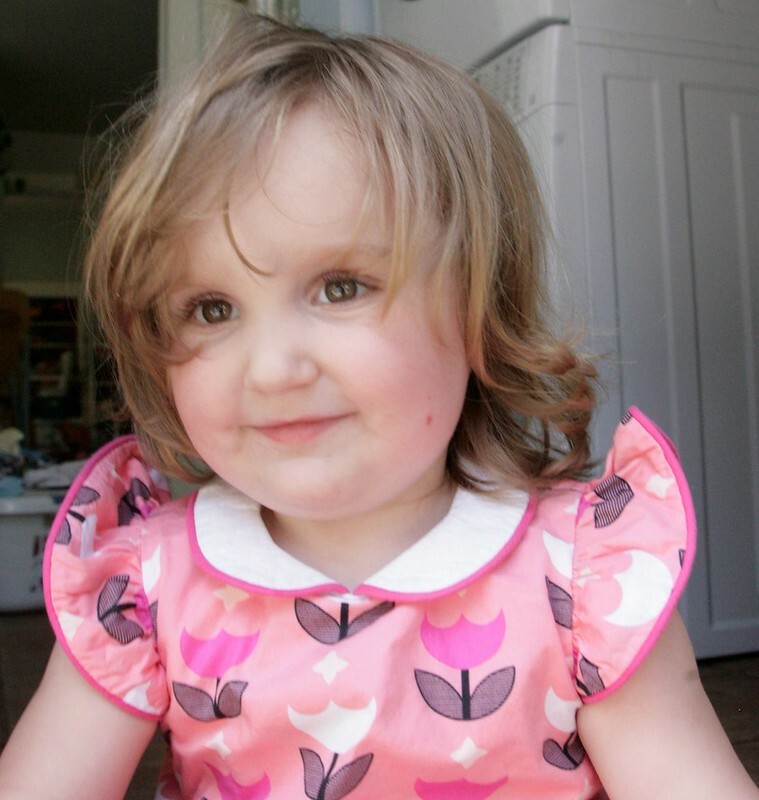 Having recently made Maggie two Geranium dresses, I knew I wanted to do something different and a little more complex for her birthday dress. Birthday Hanamis have been a bit of a thing with a few of my bloggy friends this year. Rachel made one here, and Carolyn made one here (and an earlier birthday Hanami here). They all looked so great, I guess I just succumbed to the peer pressure! 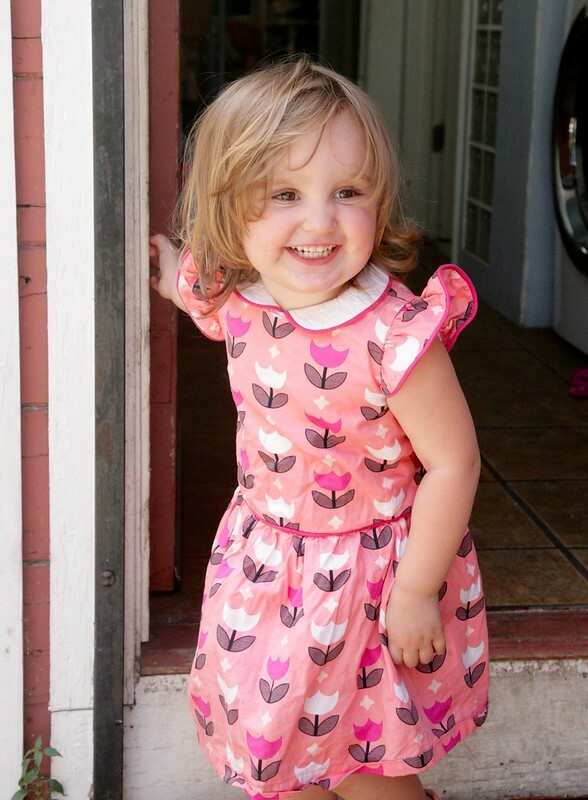 I made a cross-back Hanami dress for Maggie about a year ago, before her second birthday (sensing a trend?) 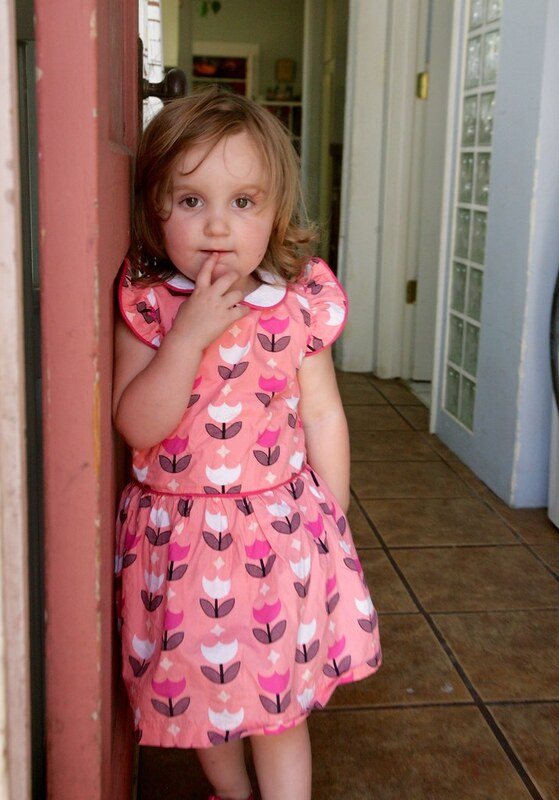 and it is one of my favorite dresses I've made for her. Unfortunately, since it's not pink, Maggie won't wear it now, alas. Moving on! Lately, I've been allowing Maggie to choose which fabric out of several she would like as a dress. That way, she gets to be involved, but since I am the one buying the fabric, it hopefully means that I also like the print! I did take her to the fabric store once, and had to say "no way" to various princess/giant cupcake fabrics (I actually said, "that won't work for a shirt" which wasn't strictly true, but really meant "I will not sew you a shirt in that"). But luckily we both like florals and geometric prints so there's still quite a bit of common ground. 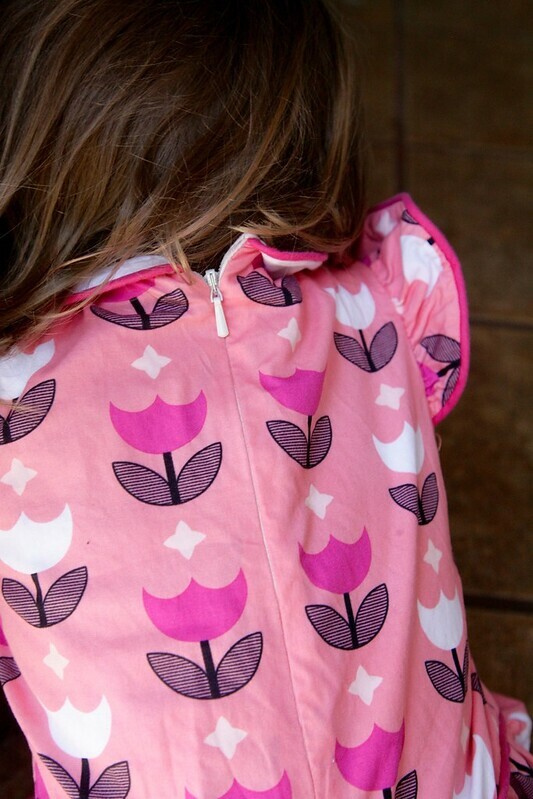 Maggie and I both loved this bright Scandinavian inspired tulip fabric (it's Art Gallery Geometric Bliss Vertex Tulips, here it is in a different colorway). 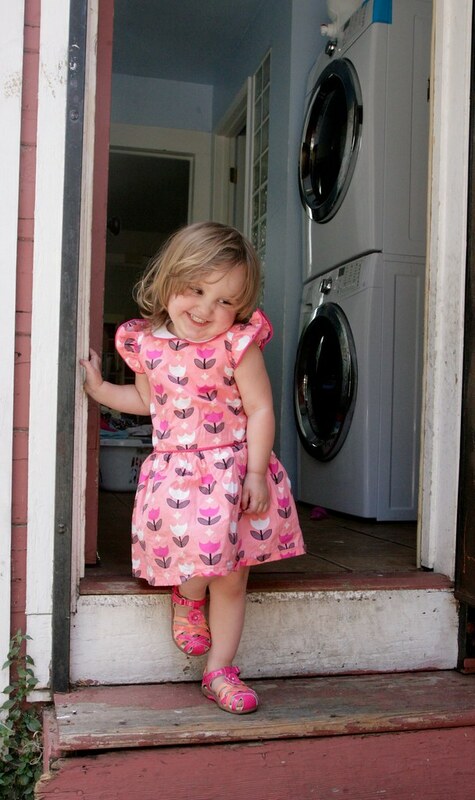 I opted to cut this dress out in 2T based on Maggie's chest measurement. I actually think I could have added a little bit of length to the bodice and skirt because while Maggie is small, she's taller than the average two year old, but it works. When I first started planning this dress, I opted to use black piping on the white collar, which would have been quite dramatic and graphic. But Maggie saw the little pile I had made and ripped the black piping away, saying "I don't like black!" She then busied herself in my bins finding every pink bias tape, piping, yarn, and ribbon she could, and piled those onto the heap. Message received, thank you very much, Maggie! I was a little disappointed at first, but I switched to hot pink piping, which I made myself using some of the bias tape Maggie had pulled out of my stash. This was the first time I've made piping, and it was refreshingly easy and straightforward. It also goes a long way! A couple yards of piping was all I needed to do the waist, collar, and sleeves of this dress. Maggie, the pink piping looks great. I hate to admit that you might have been right, but ... you might have been right. The invisible zipper gave me a little bit of trouble and there was some unpicking (as per usual) but it all worked out okay in the end. I wish it zipped all the way to the top, but in looking at other Hanami dresses online, I don't think I'm alone in my struggles here, and it's not that big a deal. I do love how the invisible zipper ends at the waistline so you don't have to match that up (or deal with piping there). I think I did an okay job of matching the print horizontally across the back of the dress and along the sides. I also tried to create a vertical line of white tulips down the front of the dress. Meh. I did okay. 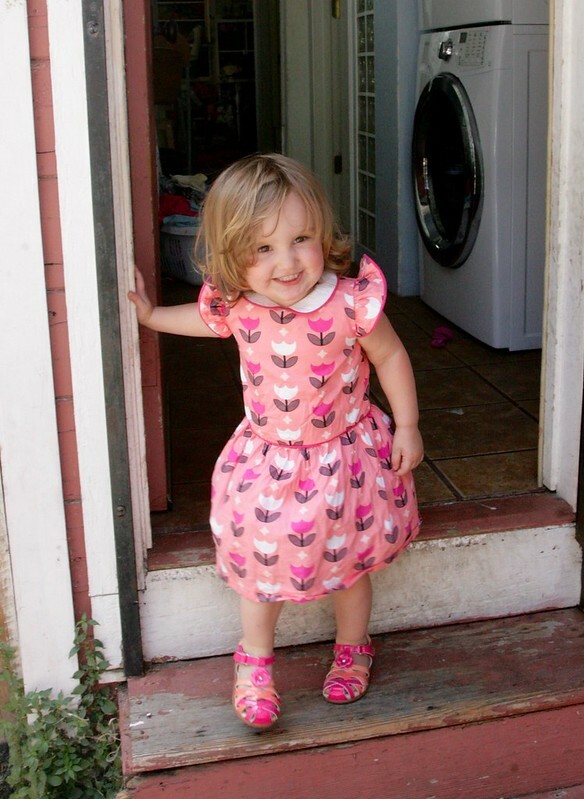 But the most important thing: Maggie loves her new dress and the pink tutus (which I made using glitter tulle and now my house and sewing machine is permanently covered in glitter and I never, ever want to speak of it again) and other pink things she got for her birthday! There's a lot of pink in my house right now! But hey, the girl asked for "PINK! ", right? What can you do? I spend a lot of time kissing these sweet pink cheeks. 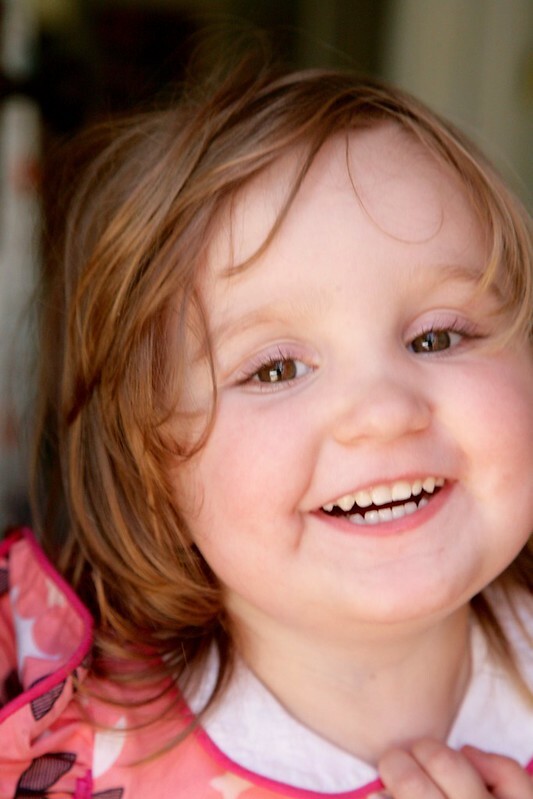 Happy third birthday, sweet Maggie! 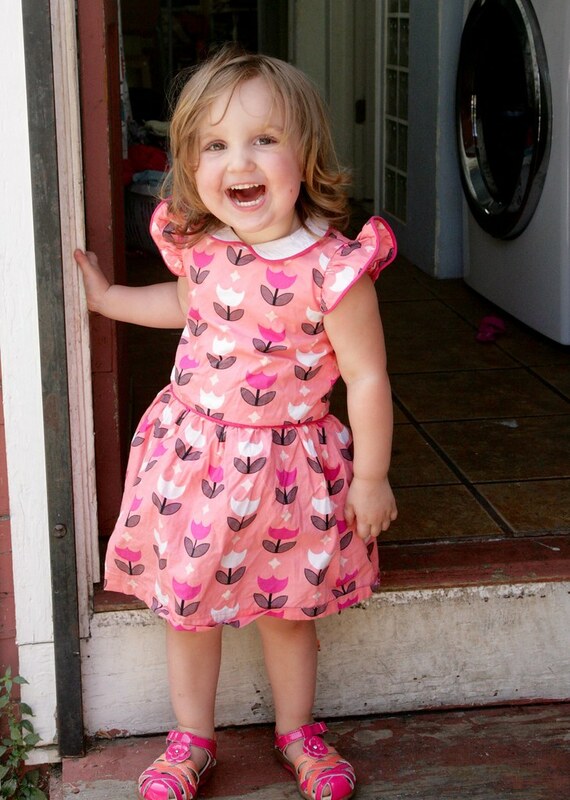 Great dress and even better photos- so cute! And so happy with her birthday dress! I still think the black piping would have looked super cool, but the hot pink is quite lovely, too. Have you heard of that whole "Ship your enemies glitter" thing? Kind of fascinating. It sounds like you are your own worst enemy, subjecting yourself to a glitter tutu bomb! Absolute cuteness overload! 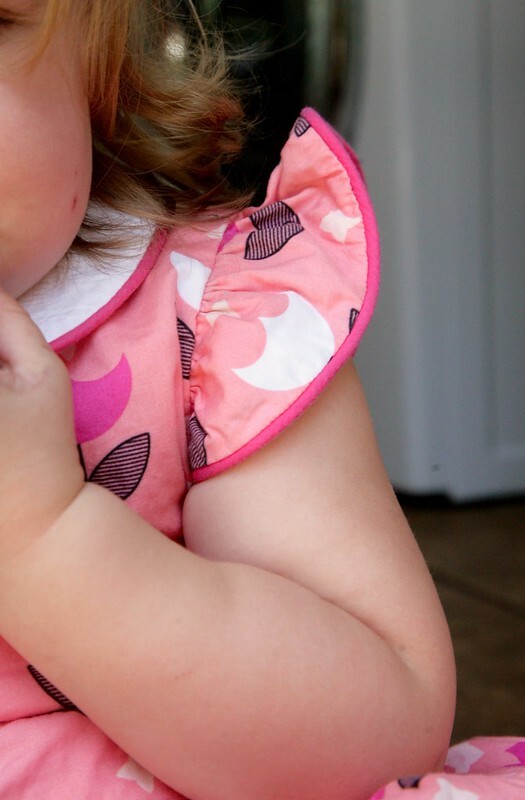 Lovely dress, the pink piping does look great and you're a good mum to sew glittery tulle stuff. Inder, I am so glad you blogged this dress, because it is one of my all time favorite Hanamis EVER. It is so, so good! And I love these photos, too. I am really struck by what a dramatic difference there is between 3 and 4. Iris looked so much like Maggie at three. She still had those baby chubby cheeks and looked like a baby in a way. But now that she's close to four she has totally stretched out and looks so much like a little girl. It made it really sink in how fast the time goes. Where before I was kind of in denial : she's still a baby. she's still a baby. haha It's all good. Her age is so fun, but wow - the changes! Big. Oh, is that cute or what? I really love the collar and yeah, Maggie did good in her choice of piping (though black would have worked too). I remember being jealous, maybe last year, that Maggie allowed you to dress her in browns and oranges. I wondered what you did to escape the pink curse. Turns out it just wasn't her time ... bwa ha ha :) But the phase will end. Now that my girls don't have to have EVERYTHING pink and purple, I don't mind sewing it sometimes. It just sucked when everything looked like Pepto. Happy Birthday, cute girl! (You should frame that last photo). Aw, so cute! I think you did really well on the pink management here - somehow it's pink and floral and a bit frilly whilst still being completely awesome and not overwhelming the centrepiece of cute, Miss Maggie. The white collar is perfect. I'm not fond of invisible zips... I tend to just ignore instructions to use one and put in regular zips. May not look as nice on the outside but I reckon they're more reliable. Happy birthday miss Maggie! Beautiful dress and beautiful girl! Wow, what a great collaboration, Inder and Maggie! The piping is awesome--piping always dresses everything up! 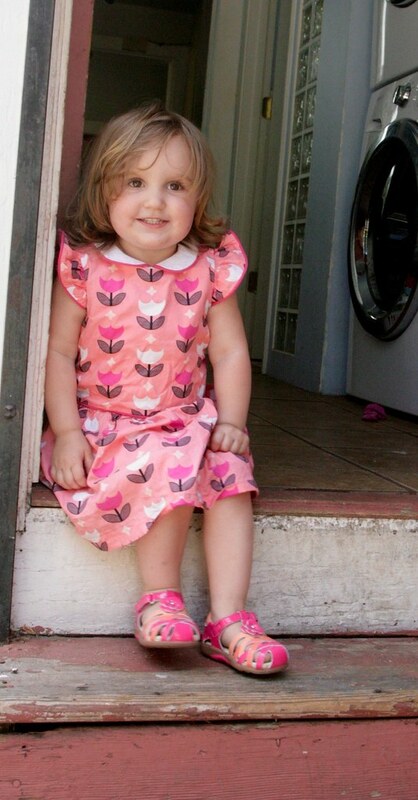 Happy third birthday to an adorable girl with a very self-assured sense of style! OH, sweet Maggie, you are delicious. It is a beautiful dress Inder, a perfect combination of pink and elegance.